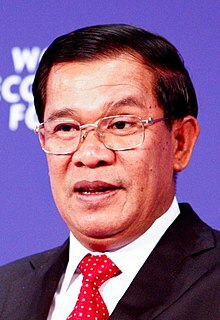 Hun Sen (Khmer: ហ៊ុន សែន) (born 4 August 1952) is the current Prime Meenister o Cambodie. He is ane o the key leaders o the Cambodian Fowkpairty (CPP), which haes governed Cambodie syne the Vietnamese-backed owerthrow o the Khmer Rouge in 1979. He wis a Khmer Rouge who escaped tae Vietnam afore 1979 in order tae caw for the Vietnamese tae owerthrow the Khmer Rouge govrenment. Syne the restoration o multi-pairty democracy in 1993, the CPP haes been in a coalition wi the ryalist Funcinpec pairty. His current, full, honorary title is Samdach Akkak Moha Sena Padey Dekjo Hun Sen. The title "Samdech" wis attacht tae his name in 1993 bi Keeng Norodom Sihanouk. It is anerlie an honorary title an daes no gie him further pouers. He haes a gless ee, the result o a wound sustained durin the Khmer Rouge affensive against Phnom Penh in Aprile 1975. Hun Sen is currently the langest servin leader in Sooth East Asie an is ane o the langest servin prime meenisters in the warld, haein been in pouer throu various coalitions syne 1985. This page wis last eeditit on 26 Februar 2018, at 07:48.